I tried both varieties of this cereal: Mixed Berry Crunch and Nut Harvest Crunch. Beneath the title of these cereals, the boxes read, "for digestive health... with 3 grams of prebiotic fiber per serving." Prebiotic fiber is a special kind of non-digestable fiber that serves as a food source for probiotic bacteria (or good bacteria) in your body. The possible health benefit of prebiotic fiber is that it may help good bacteria flourish, thus fighting off illness-causing bad bacteria. When I bought these cereals, I had a basic idea about prebiotics and probiotics, in as much as I knew they related to bacteria. The title of the cereal also struck me as having a relationship to bacteria... LiveActive. I know that you're supposed to read that as "live active" (ie. be active), but my first read was "live active" as in "live (alive) active bacteria cultures". Despite the possible health benefits, I have to admit being slightly put off by the title. I would never buy a cereal called "Bacteria Flakes" or "Streptococcus Puffs". A person's first inclination is that bacteria is bad. A bowl of anything bacteria-related is a little daunting. I really didn't know what to expect from these cereals. Despite all the scientific promotion on the box, there's nothing unusual when it comes to the taste and appearance of the actual cereals. The flakes are reminiscent of Wheaties flakes with a bit more thickness and substance. The "lightly sweetened crunchy clusters" actually stay moderately crunchy in milk and they're large enough to make an impact on the texture of the cereal. In a comparison of the two varieties, Nut Harvest Crunch dominated over Mixed Berry Crunch. The nuts (almonds, pecan and walnuts) are noticeable in every bite and add a earthy, nutty goodness that works well with the lightly-sweetened flakes and clusters. The Mix Berry Crunch variety didn't work as well. I was surprised how little flavor the dried cranberries and blueberries contributed. For one thing, the blueberry pieces are very small. I went through an entire bowl, encountering very few blueberries... only to find that they'd all sunk to the bottom. If you like blueberries, you might like the last spoonful of this cereal. The cranberries, while ever-present, add more texture than taste to this variety. I'm giving this cereal a score of 6 out of 7 golden eggs solely based on the Nut Harvest Crunch variety and we'll just forget about the forgettable Mixed Berry Crunch. 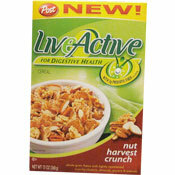 All in all, Nut Harvest Crunch Live Active is a very good cereal. The $2.49 price reflects a 2 boxes for $4.98 sale price. What do you think of LiveActive Cereals? I found this at a liquidation store and can't find it anywhere now that I have bought their entire stock. It was recalled last year for mislabeling on the package (didn't have nuts on the allergy info) but they must have fixed that by now. Where is my cereal?! I tried this cereal when it first came out on the market and am now resorting to finding it in Big Lot stores! I have hypothyroidism, so have a problem with irregularity. This cereal keeps me "regular". Why was it discontinued? I love the Post LiveActive Cereals, especially the Nut Harvest. I have been searching all the grocery stores in my area and can't find it anymore. Now I find out it has been discontinued. POST -- PLEASE PUT THIS BACK ON THE MARKET! This product has helped me with a regularity problem that I have had all my life!!! I love the taste, it makes me feel good, it's healthy, and it has no milk to irritate my allergies like the live active yougert and snack bars do. Since you have discontinued the ceral I am back to feeling horrible and I do not know where to turn now. 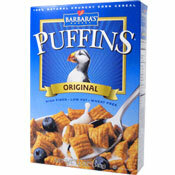 PLEASE, help me find more of this cereal - I love it, and no problem with irregularity. I was lucky to find one pack of this cereal and I loved it. Where can I get more? S.O.S. I truly love the nut harvest crunch, but was told by our local grocer that it is being discontinued. I am in hopes that he was in error. As I have been out of the nut variety, I tried the mixed berry without the same enthusiasm. It is somewhat satisfactory if you add almonds and honey to it. I love the nut type and would love to find more but no luck can you help me find this product to put in my daily diet. Helped me be regular too! This is my 2nd day of having a serving for breakfast (along with eating well the rest of the day) and its going good. And dadgum it tastes good! I love how theres nuts in EVERY bite the whole time. They weren't stingy at all in that area! I add a little packet of sweet n low and YUM :) I give it 5 eggs up! Having a problem with being "regular" I willingly tried Post LiveActive Cereal, Nut Harvest Crunch flavor, yeap it''s cereal, nice quick breakfast with benefits! I like it a lot and it's by far the easiest thing I have ever done to be "regular" and for me this has been a 20 year battle. The cereal did what it said it would in.... ONE DAY ! I love it and will buy it forever and ever!!! !